Restaurant kitchens rely on the restaurant supply superstore for Oven Cleaners to clean the ovens and equipment in their kitchens. We carry every kind of foodservice Cleaner for getting those tough grease stains clean. Grill cleaners are heavy duty as well for cleaning the tough grill grease off. Procter and Gamble DCT Grill Cleaner - 3.6 Oz. Procter and Gamble DCT High Temperature Grill Cleaner - 32 Oz. Procter and Gamble DCT Oven Cleaner - 1 Qt. U.S.C. Misco Oven and Grill Cleaner Spray - 1 Gal. U.S.C. Aerosol Foaming Grill and Oven Cleaner - 18 Oz. U.S.C. Dig Gallo Grill Cleaner - 1 Gal. U.S.C. Enterprise Golden Corn Grill and Oven Cleaner - 1 Gal. 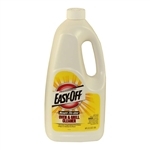 Easy Off Heavy Duty Regular Scent Aerosol Oven Cleaner - 14.5 oz. Suma Foam Free Oven Cleaner Liquid - 32 Oz. Buy wholesale commercial grill Cleaners for commercial kitchens in bulk cases to remove baked on grease.